CarGurus has 2,053 nationwide G80 listings starting at $23,995. From a design standpoint, the Genesis G80 is a rakishly rendered luxury automobile, but the car’s interior execution is not quite as convincing. Last year, this car was a Hyundai. This year, this car is the 2017 Genesis G80. Does the new G80 have what it takes to compete with other midsize luxury sedans? The short answer is yes, but with an upscale brand come upscale expectations. After years of dipping its metaphorical toes into the opulent end of the automotive pool, Hyundai finally dives in, establishing a full-fledged luxury brand called Genesis. Genesis launches with two models, the G80 midsize sedan and the G90 flagship sedan. The company promises four additional vehicles in the near future, including a G70 entry-level model, a couple of SUVs (to use XG nomenclature, perhaps? ), and a performance-oriented car. 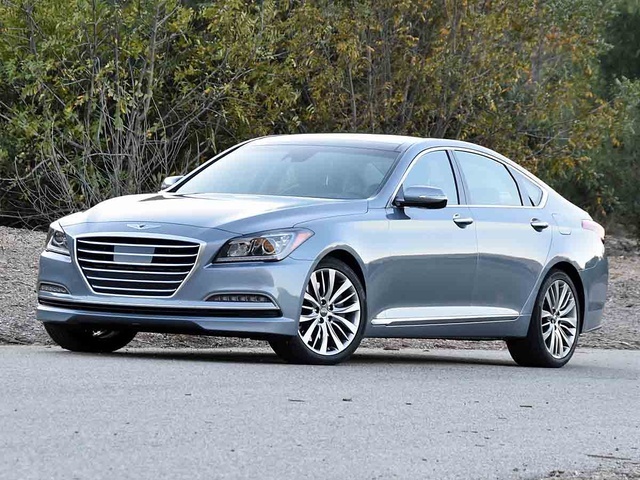 Sold through Hyundai dealerships, Genesis models include free scheduled maintenance with valet service for the first three years of ownership, which means buyers won’t need to mingle with the common folk drinking bad coffee in a harshly lit waiting area. 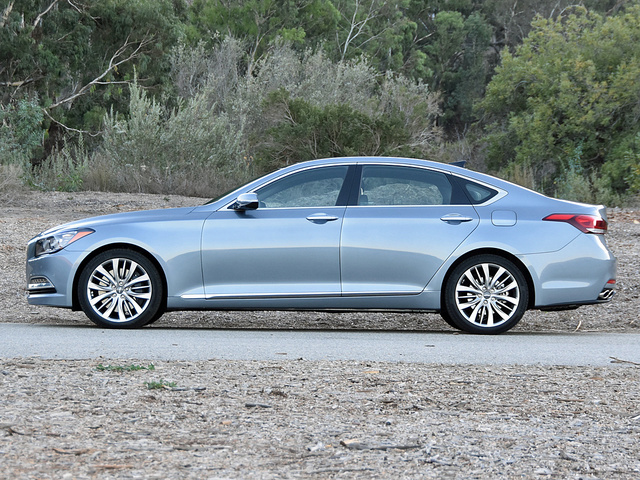 The subject of this review is the G80, which some people might recall as the Hyundai Genesis of last year. Indeed, the G80 is last year’s Genesis, featuring a handful of improvements in addition to its name change. They include minor paint-color adjustments, the aforementioned Genesis ownership privileges, and additional driver-assistance and collision-avoidance technologies included as standard rather than optional equipment. Next year, for 2018, the Genesis G80 will get a more significant upgrade, as announced in conjunction with the 2016 Los Angeles Auto Show (my video review was filmed prior to the announcements in L.A.). 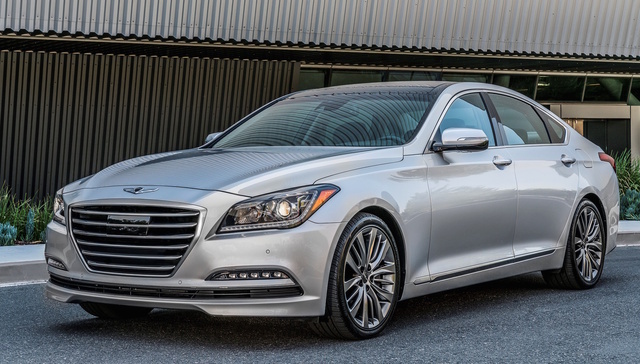 A new 3.3T Sport model arrives, all versions receive styling and interior updates, the standard equipment list is upgraded yet again, and Genesis expands availability of its all-wheel-drive (AWD) system. The 2018 G80 arrives in the spring of 2017. In the meantime, you can get the 2017 G80, offered in 3.8 and 5.0 trim levels. The G80 3.8 is the base version, equipped with a 3.8-liter V6 engine, rear-wheel drive (RWD) or AWD, and a base price of $42,350. My test car was the G80 5.0, painted a lovely hue called Parisian Gray and equipped with everything that can possibly be installed on the car. The price came to $55,500. Perspective is necessary when evaluating the value of that price tag. Compare the loaded G80 5.0 model’s sticker price to a basic Mercedes-Benz E300 at $53,075. The turbocharged 4-cylinder Benz doesn’t even have metallic paint or leather for that price, let alone the roster of equipment boasted by the Genesis. Plus, when it’s time for an oil change, you'll need to schlep the E-Class to the Mercedes dealership yourself, whereas with the Genesis G80 somebody will fetch the car from you. Personally, I think the Genesis G80 is better looking than the Mercedes E-Class, too. It is a rakishly rendered automobile, its rear-drive platform providing properly balanced luxury sport sedan dimensions, and its compact greenhouse belying a roomy, full-size cabin. Inside, the car’s execution is not quite as convincing, mainly because it looks too much like a Hyundai in terms of switchgear, label fonts, and the infotainment system. 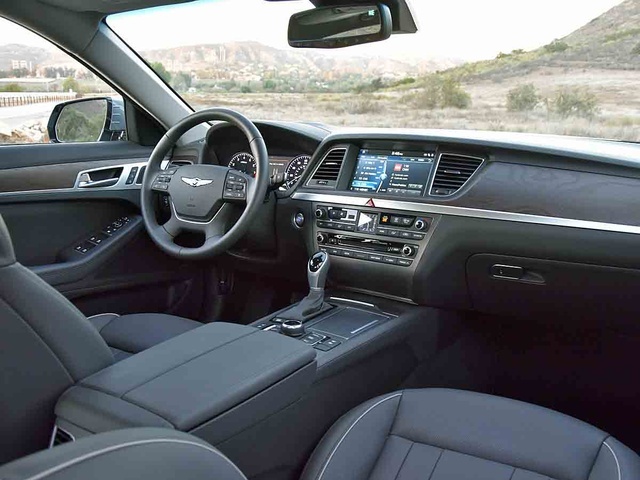 Aside from the controls and displays, though, the Genesis G80 boasts quality materials, attention to detail, and a clearly upscale look and feel. For 2017, the Genesis G80 is available with a 3.8-liter V6 engine or a 5.0-liter V8 engine. Both engines are paired to an 8-speed automatic transmission and RWD. An AWD system is an option for the G80 3.8 model. My test car was the G80 5.0, making a robust 420 horsepower and delivering swift, silent, effortless acceleration. Just enough rumble makes its way into the G80’s remarkably quiet cabin to remind the driver that eight pistons are pumping away under the hood, and while you might assume that a 5.0-liter V8 engine would get lousy gas mileage, I averaged 19.3 mpg on my test route, beating the EPA’s estimate of 18 mpg. The 8-speed automatic is an excellent transmission. Three driving modes are available, and while I did not use the Eco mode, I did try Sport. It solves a complaint I have with delayed downshifts for passing when the car is in Normal mode, and it firms up the steering. Despite the 19-inch wheels and staggered-width tires that come with the V8 engine, the G80 supplies a supple ride quality. What it needs, though, is an adaptive damping suspension so that when you switch to Sport mode and drive with enthusiasm, the car’s body motions are better controlled. This is coming for 2018. Still, I had fun tossing this 2017 G80 around on my test route. It rotates nicely in corners, the brakes withstood abuse in high temperatures, and the paddle shifters help to make the car more engaging to drive. With some better tires and a tighter suspension, the G80 could be a legitimate sport sedan. On the open road, it effortlessly devours miles while occupants enjoy the comfortable and quiet cabin. The G80 also shrugs off decaying city streets and proves easy to parallel park, though the G80’s single-view reversing camera isn’t as sophisticated as the multi-view camera Hyundai offers in the Santa Fe. Again, this multi-view upgrade is coming for 2018. While quality levels are high, in some cases the Genesis G80’s switchgear looks and feels too much like that of a Hyundai. In other cases there’s just too much of it, creating functional overlap and redundancy that can lead to confusion and distraction. On a positive note the stereo and climate systems are easy to operate, thanks to numerous knobs and buttons. I just wish their locations were reversed. 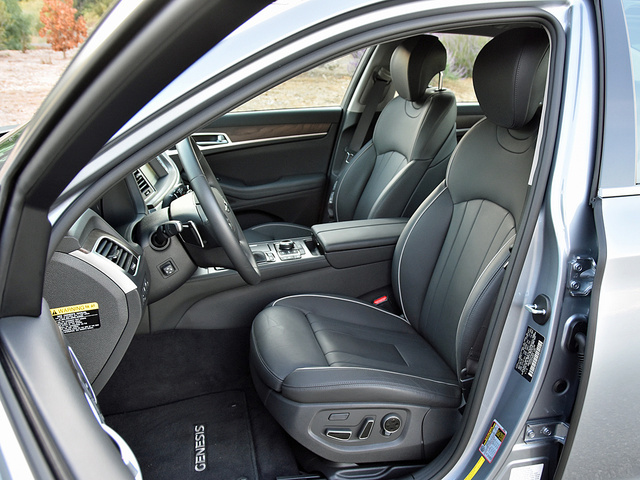 Comfort levels impress, though the center-console armrest padding could be softer. My G80 5.0 test car’s driver’s seat offered an extending thigh-support cushion, and both front seats were heated and ventilated. The rear seats were super comfortable, too, but Genesis fails to provide heated rear seats, sun shades, or even a USB port for rear passengers. Those are all glaring oversights for a luxury midsize sedan. 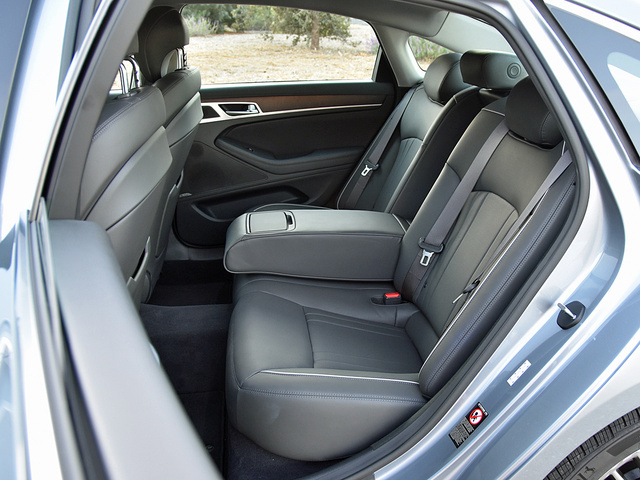 Here’s another curiosity: The G80 doesn’t have a split-folding rear seat. It has a ski pass-through, but if its 15.3 cubic feet of trunk space isn’t enough, you can’t expand it. The Genesis G80’s infotainment system is easy to understand and use, but I do have a couple of complaints related to my test car. Sometimes, the radio station pre-set buttons proved unresponsive. Also, the navigation map never displayed traffic conditions, even with the right box checked in the programming menu, and when you’re driving in traffic-clogged Los Angeles, that proves frustrating. Otherwise, the upgraded 9.2-inch touchscreen system included in the G80 5.0 proved intuitive, and the 17-speaker Lexicon stereo absolutely thundered with music. Strangely, though, this version of the G80’s infotainment system did not offer smartphone projection technology in the form of Apple CarPlay or Android Auto. One of my favorite things about the G80 is its heads-up display. This is one of the best in the industry, capable of conveying a wealth of information in a very small space. That includes blind-spot warnings, which give an extra measure of confidence in heavy traffic. With the switch to Genesis, the G80 gains several safety-related driver-assistance features as standard equipment. They include adaptive cruise control with stop and go capability, forward-collision warning and automatic emergency braking, a lane-departure warning system with lane-keeping assist, and a blind-spot warning system with rear cross-traffic alert. This suite of safety systems works well, though the lane-departure warning and lane-keeping assist system demonstrates accuracy problems when roads narrow to one lane or expand to two lanes of travel in the same direction. This, however, is common across many car manufacturers. As a part of the G80’s available infotainment services package, the car supplies automatic collision notification, SOS emergency assistance, and teen driver-safety technologies including speed, curfew, and boundary alerts. Additionally, the Genesis G80 is a Top Safety Pick Plus according to the Insurance Institute for Highway Safety (IIHS), and it earns a 5-star crash-test rating from the federal government's NHTSA. 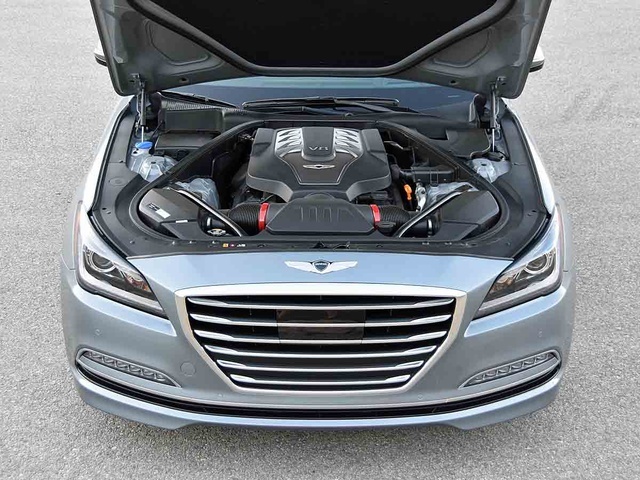 Considering my test car exceeded EPA fuel-economy estimates and that the Genesis G80 is engineered to meet the requirements of the most comprehensive warranty program in the industry, chances are excellent that it will satisfy its owners from efficiency and reliability standpoints. However, as this review is written, lease deals aren’t particularly attractive, requiring $3,999 at contract signing in order to obtain a monthly payment of $415 per month (before including tax, title, and registration). And that’s for a standard G80 3.8 driven just 10,000 miles per year. Still, this payment is less than is required to get into a leftover 2016 Mercedes-Benz E-Class, and by $85 per month. Thus, the challenge facing Genesis is stripped bare. An aspirational consumer seeking luxury-brand cachet needs to cough up the equivalent of only 10 Chipotle burritos per month in order to afford the E-Class. Something tells me that a person shopping for a midsize luxury sedan will easily find a way to make the Benz lease fit a budget. Don’t get me wrong. The 2017 Genesis G80 is a nice car, and I like it quite a bit. It isn’t perfect, though, and several of its shortcomings seem like easy fixes that should have been made before this new luxury brand launched. Worse, because it gets pitched against midsize luxury cars that are increasingly superior as far as technology and creature comforts are concerned, the G80 could be forced to rely upon bang for the buck in order to sell. And that’s exactly the same value proposition it offered when it was a Hyundai. Just without the free maintenance and valet services offered by Genesis as an enticement to give something new a try. When this car was a Hyundai, it was easy to recommend based solely on the strength of its value. 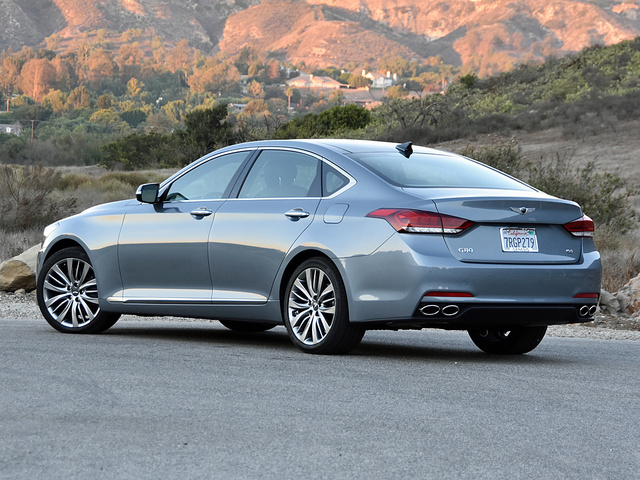 As a Genesis, the G80 will have to play to a different set of expectations. While it remains a good deal, buyers in this segment are typically seeking traits other than a bargain. What's your take on the 2017 Genesis G80? Have you driven a 2017 Genesis G80? I bought a car from the description on Car Guru's. when it was delivered it was not the same as described. How can I get a copy of the description from Car Guru's to make sure I was right?